Manually operated valves use knobs, hand-wheels or levers as their actuators for operation. The hand-wheel or knob can be turned clock-wise (or counter-clockwise) to open, close or proportion the valve opening. Valves that use knobs or hand-wheel actuators are referred to as “multi-turn” valves. These include gate and globe valves. Valves that use lever actuators (in most cases) and rotate 90 degrees are referred to as “quarter-turn” valves. These include ball valve, plug valves and butterfly valves. In situations where manual operation (actuation) of a valve is not possible, such as remote locations or on very large valves, a pneumatic, electric or hydraulic actuator is required. Electric actuators are available in multi-turn or 1/4 turn configurations, as are hydraulic actuators. Pneumatic actuators are available in 1/4 turn configurations, or as linear movement actuators which raise and lower the yoke on multi-turn valves. 1/4 turn actuators are further broken down in to two categories: scotch-yoke and rack and pinion. 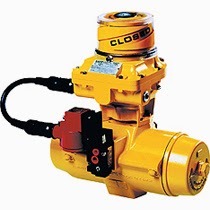 Actuators provide the power (force or torque) to open and close valves. Different size valves require different size actuators. The larger the valve, the larger the actuator. Some actuators include internal or external springs to return the valve to a resting position. When springs are included, the power of the actuator has to be great enough to overcome the valve properties and the spring properties. Additional considerations when sizing an actuator are the dynamic fluid properties of the process and the seating/unseating properties of the valves. Both of these may have a significant impact on the amount of power (force or torque) needed by the actuator to reliably and repeatedly operate. 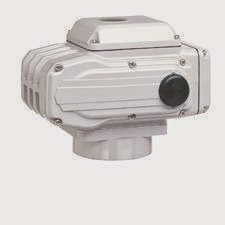 Electric actuators use motors and gear boxes to provide their power. Pneumatic actuators use air cylinders. The horsepower, gearing and size of the pneumatic cylinders change according to the torque or linear force required by the valve. When applying actuators to any valve or controlling device, the consultation with an experienced application engineer is recommended so that safety, proper function, cost-effectiveness, and long service life can be assured.